Foldable smartphones are still to prove their value proposition in the market, and we will see if they become popular among end users. It goes without saying that foldable handsets represent a technological challenge in the unique way smartphones are used. 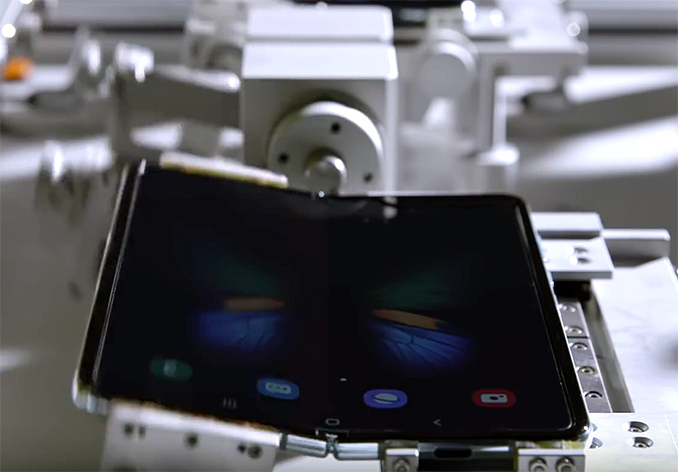 Samsung, through a released video, has stated that its Galaxy Fold device is not only impressive in terms of technology, but is also reliable enough to be folded and unfolded for over 100 times a day for five years. The company even published a video showing how it tests the handset for reliability. There are several challenges that companies like Samsung face when developing foldable smartphones. Firstly, they required a 0 – 180º fully inward (or outward) foldable AMOLED display. Secondly, they needed to develop a lightweight and durable hinge. Thirdly, they had to build internal electronics/cabling in such a way that they would survive thousands of fold/unfold cycles. Fourthly, they needed to design software/firmware to enable owners to use foldable handsets efficiently (e.g., switch from cover displays to main ones, tailor Android apps for larger screens, etc.). When it comes to foldable hardware, reliability is a must. Samsung states that smartphones are used for ~100 times a day on average, so the AMOLED displays (as well as hinges) have to survive years of active usage without harming color reproduction or rigidity. If one folds and unfolds their phone for ~100 times a day, then the number of fold/unfold cycles the handset will have to survive will total 182,500 in five years (100*365*5). 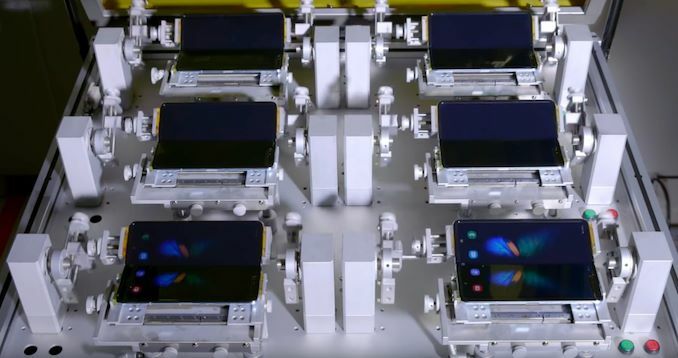 Since people may use it slightly differently, Samsung tests its Galaxy Fold smartphones for 200,000 folds and unfolds, just to make sure, the company said. In fact, the manufacturer has even built a robot that can perform such tests and demonstrated its work on a new video. One thing to note about the number of fold/unfold cycles that smartphones have to survive is the actual use case - depending on how often users will actually open up the device. With a screen on the outside, one might argue that Samsung devices will not be unfolded as often as say, the Huawei version. But the new form factor may indicate new use cases that current smartphoens are not being used for. Therefore, a $1980/€2000£1799 question is whether foldable smartphones will survive a new use model. Ian: It's worth pointing out that it should be obvious the reasons why and how Samsung (and Huawei, and others) test the folding repetative act on their devices. All smartphone manufacturers do physical testing of their devices the same way, and at scale - if there's a button, it gets pushed 100k-500k times. If there's a headphone jack, one gets put in 100k-500k times. If there's a fingerprint sensor, it gets tested 100k-500k times. If it has a drop rating, it gets tested for being dropped. Pretty much everyone does the testing how you would expect - I've seen several testing labs as a reviewer and they really all look pretty much the same. Most companies will test a certain number of devices every batch to ensure compliance with their own internal testing; what will differ between the companies is what they define as 'acceptable use', and how that ties in to the warranty. The key thing here is that not every device is tested up to the 200k - just a select from from each batch. It is likely that those coming off the line might be tested a few times (100-500) just to remove any potential 'early failures' that can occur, so devices are not dead on arrival. what kind of knucklehead adult would put his/her $2,000 toy within reach of a toddler??? oh... yeah, your average 1%-er. And how would you test for aging in a brand new smartphone? Chances are, the materials used here have been in research for years, maybe tens of years. And along the way, they have undergone strenuous testing already and they have a lot of data points to get some extrapolation done on this thing. Not perfect, but you have to make a cost/reward analysis. It usually works out. Sometimes it doesn't (Note 7).